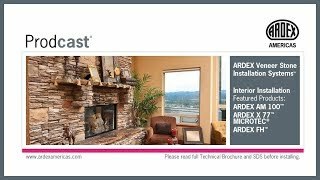 ARDEX AM 100™ is a unique smoothing and ramping mortar for vertical and horizontal concrete and masonry surfaces that significantly reduces the preparation time prior to the installation of all types of tile and stone. It can also be used to slope balconies and create slope to drains. ARDEX AM 100 is ideal for fast-track tiling applications in wet areas for the smoothing of swimming pools,showers, fountains and below-grade installations, such as subway stations. Storage: Store in a cool dry area. Do not leave bags exposed to sun. Protect unused material by removing air from bag and sealing tightly. Google's Pittsburgh office needed kitchen renovations, but the existing gypcrete substrate needed to be replaced first.